Even though quinoa isn’t technically a grain, I’m learning that it shares one major trait of most grains: You can put it in almost anything. Scones, muffins, smoothies… the list is pretty endless. When I cook quinoa these days I just cook the whole bag of it (which is a lot) because I know I can use the leftovers in all kinds of fun stuff. On this particular day, I made some pancakes that turned out really great so I thought I’d share them! Quinoa gives these standard buttermilk pancakes some great texture. A perfect use for leftover quinoa! 1) Cook quinoa according to instructions. Let cool a bit before using in pancakes. Using leftover quinoa is the best option. 2) Mix dry ingredients together in a large bowl. 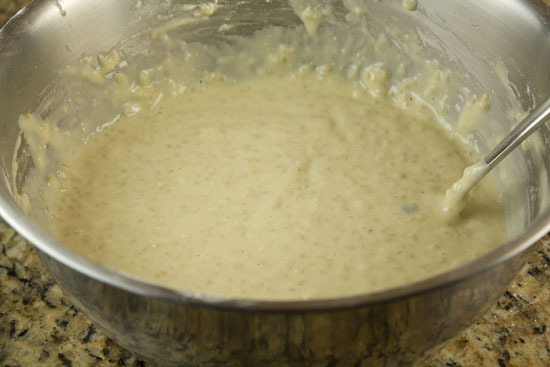 3) In a smaller bowl, mash banana until it’s a paste. Stir in wet ingredients (milks and eggs) and quinoa. 4) Mix wet stuff into dry stuff and stir well to combine. 5) Finally, stir in melted butter. 6) Put a nonstick pan or griddle over medium heat and once hot, add a tiny pad of butter or spray with nonstick spray. Ladle on about 1/2 Cup of batter. Feel free to make them bigger or smaller. That’s just a good starting size. 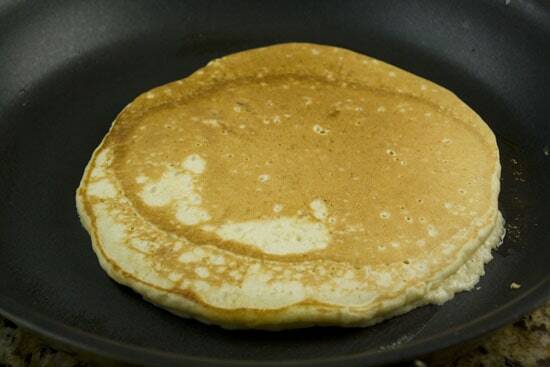 7) When bubbles form on top of the pancake and the edges firm up a bit, flip it! 8) Cook for a minute on the second side. 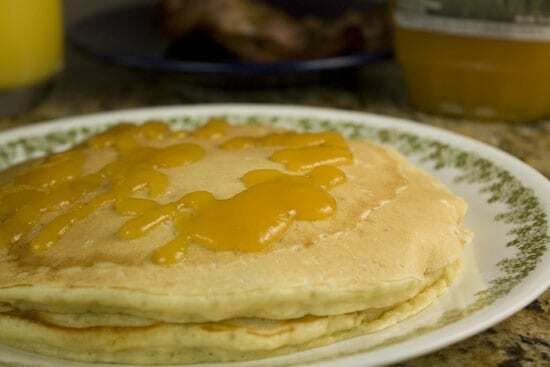 9) Serve immediately with syrup and butter. Ok. I’ll be completely honest. I’m not sure if I’d recommend making quinoa just for these pancakes. It’s not that they aren’t good, but I consider pancakes to be a quick breakfast. They really only take 10 minutes to whip together. So adding 25 minutes onto that time just to add in some quinoa probably doesn’t make sense. What I do recommend though is making a lot of quinoa, using some of it for a different quinoa dish, and saving a cup of the cooked stuff for these pancakes over the weekend! If you’ve never made quinoa before, have no fear. If you can make rice or pasta, you can make quinoa. Unless your quinoa specifically says that it’s pre-washed, I would always wash mine a bit. I typically do this in a strainer, but I’ve used a bowl in a pinch. Once the quinoa is rinsed well, you can usually just follow the instructions on the package. Depending on the exact kind of quinoa you have, it might vary a bit. 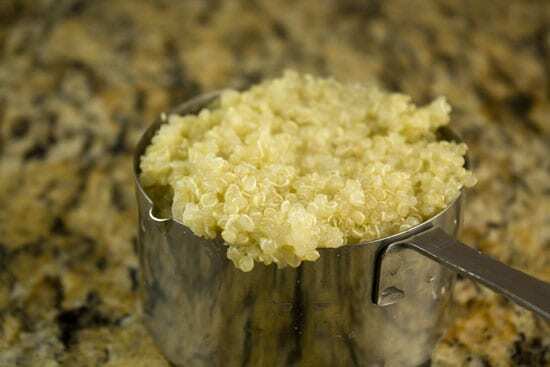 Normally, you want to add 1 Cup of quinoa to 2 cups of boiling water, then let it simmer, covered for about 20 minutes. You should end up with a nice, light finished dish. It shouldn’t be mushy at all. You can use a fork to kind of fluff it up like you would with rice. 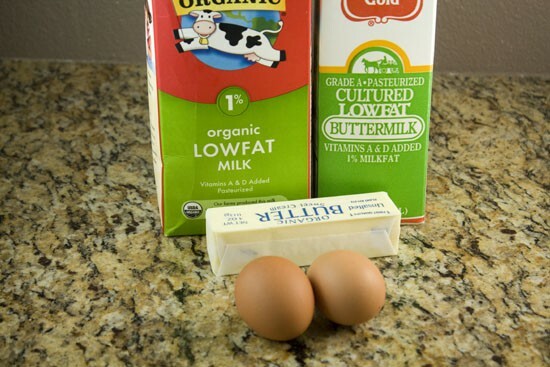 Besides the quinoa, this is a pretty standard buttermilk pancake recipe. You’ll need some dry stuff like flour, salt, baking powder, and baking soda. The wet stuff is also pretty standard. The only changes I made to a completely standard recipe besides the quinoa was to mush up a banana and add that to the batter. I also used brown sugar instead of normal sugar. Both of these gave the pancakes a wonderful richness. I really recommend them, but the pancakes would be fine without them also. To make the batter, stir together your dry ingredients. In a separate bowl, mash up the banana and then add the liquid ingredients (milks and eggs). Finally stir in the quinoa. Add this liquid mixture to the dry ingredients and stir well to combine. Finally, stir in your melted butter. My batter was perfect on try one, but pancake batter can always be a bit touch and go. Feel free to thin yours out with more milk if it looks too thick. Every time I cook pancakes for someone, I get the same two questions: 1) How do you know when to flip and 2) How do you know when they’re done. Now, of course, the timing depends on a huge number of variables including the pan you are using, the size of your pancakes, and the heat of your stove. Assuming you have a good nonstick pan and your pan is over a medium heat, you’ll probably need about 3-4 minutes total to cook a pancake. As far as when to flip, there’s a visual clue. 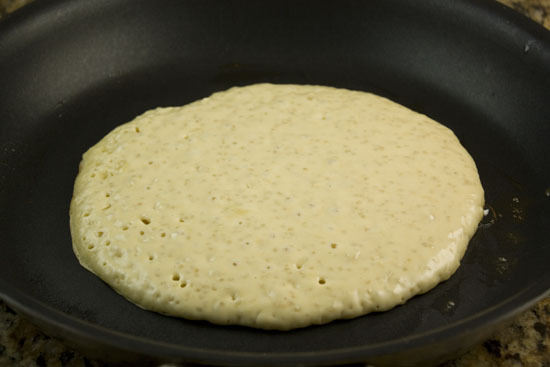 Look for big bubbles to form on top of the pancake. The edges should also start to firm up a bit. This guy, for example, is ready to flip! Non-confident flipping will end in a big mess. Once the pancake is flipped it probably only needs a minute on the second side. It definitely needs less time than side one. Butter and syrup are obviously good on these guys. I used a peach syrup that we had in our pantry that turned out to be very good. Assuming that you cook the quinoa well, it gives the pancakes this awesome texture. It’s not crunchy, but it just feels more substantial somehow. 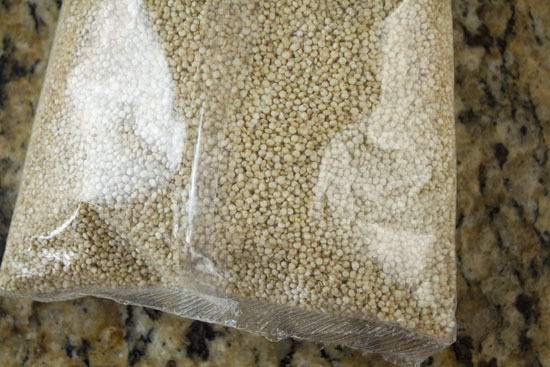 If you really wanted to pack these full of quinoa flavor, they do make a quinoa flour as well that can be purchased at most natural foods stores. The problem is that it’s probably the most expensive flour that you’ll find. A single small bag of it will easily run you $10. But using normal flour and stuffing it full of the cooked stuff ended up being a great pancake variation. Give this a shot if you ever have some quinoa left over. Thanks for the great addition to my quinoa repretoire! I just love the stuff as the base to a roasted veggie salad with goat cheese & a citrus-jalapeno vinegarrette. I haven't tried quinoa pancake but I have read that it is very nutritious. 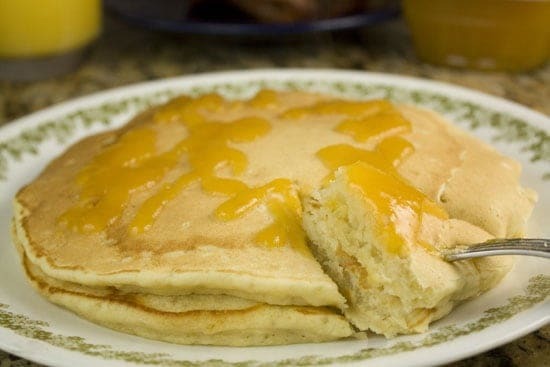 I like this recipe because I love eating pancakes and put a syrup and butter on top of it. I just wonder if there is available quinoa in the local grocery in my place. Thanks for suggesting the recipe. This recipe is so delicious. Normally when I eat pancakes, I crave some sort of extra protien like eggs. But these were so satisfying! Fantastic recipe. I didn’t have any buttermilk so I just used all milk and it was still really good. Thanks! I have made done it like you are saying, but just threw the quinoa into my Krustez pancake mix. My mother-in-law blends the quinoa so that it doesn’t have the crunch, basically “hides” it for my daughter. Anyway you cut it, they are actually pretty good. This is my favorite pancake recipe and I have been making it a long time. If I do not have bananas, I substitute pumpkin or another fruit, like apricots. I throw in cinnamon and vanilla, as well. My son loves these.